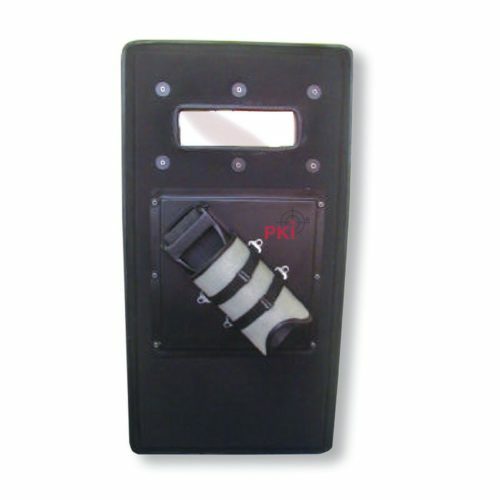 The PKI 9835 has been developed for the use by explosive disposal and tactical teams. Years of research and attention to details finally have resulted in a highly protective shield with outstanding manoeuvrability, being now available with the PKI 9835, and already in use in many countries throughout the world. It provides a maximum protection against overpressure and fragmentation during explosive disposal operations whilst being light enough to be held with one hand. This shield is equipped with removable spring-loaded legs making it self-supporting for lengthy operations. In the stowed position, the legs latch into the edge of the shield for easy storage and manoeuvrability. Just one quick push releases the supporting legs into the deployed position, allowing the shield to be self-supporting. Impact attenuation forehead and forearm impact attenuating by special shock absorbing foam-pads built into the inside surface of the shield. These are designed to absorb shocks from fragments, bullets and pressure-wave impacts.